Ultimate Pattern Smash Up. 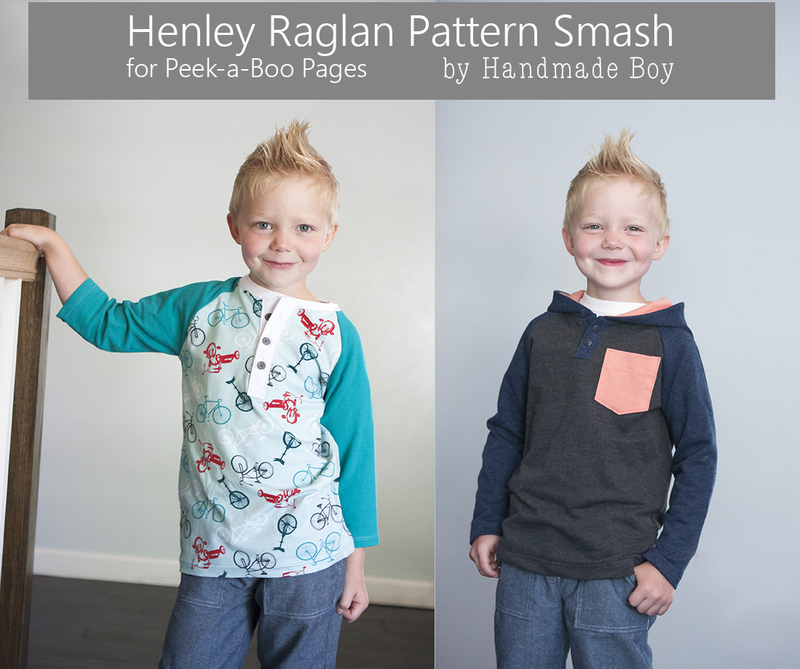 The Henley Raglan - Peek-a-Boo Pages - Patterns, Fabric & More! I have been wanting to do this for ages and am so excited that I finally did it! 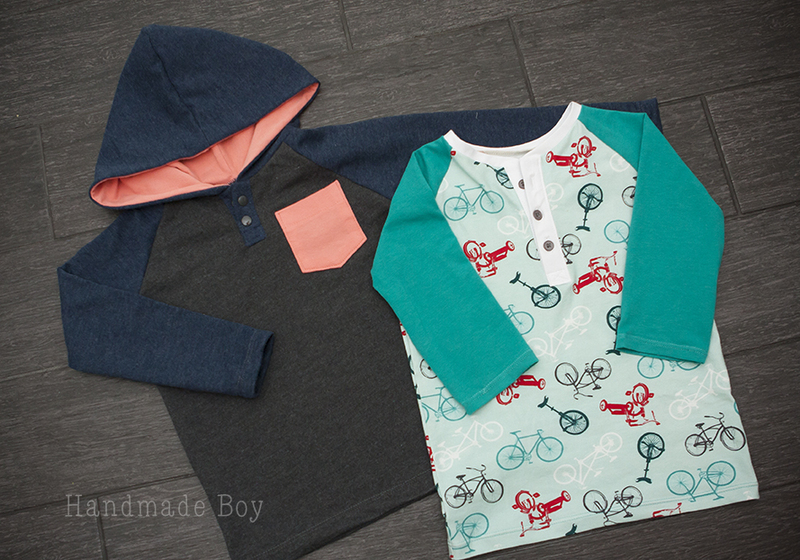 I smashed THREE of my favorite Peek-a-Boo patterns to come up with the henley raglan. It was so easy I’m kicking myself for not doing it earlier! I’m going to share with you have easy it was. And better yet, we are going to do TWO different styles! One with a hood, and one with a regular henley collar. Eeeek! Are you excited?! You are going to need the following patterns, The Classic Polo, The Boardwalk Henley, and The Grand Slam. First, we are going to construct the basic raglan henley. You are going to use the sleeves and body from the Grand Slam, the collar from the Boardwalk, and the pocket (optional) and placket from the Classic Polo. Step 1. 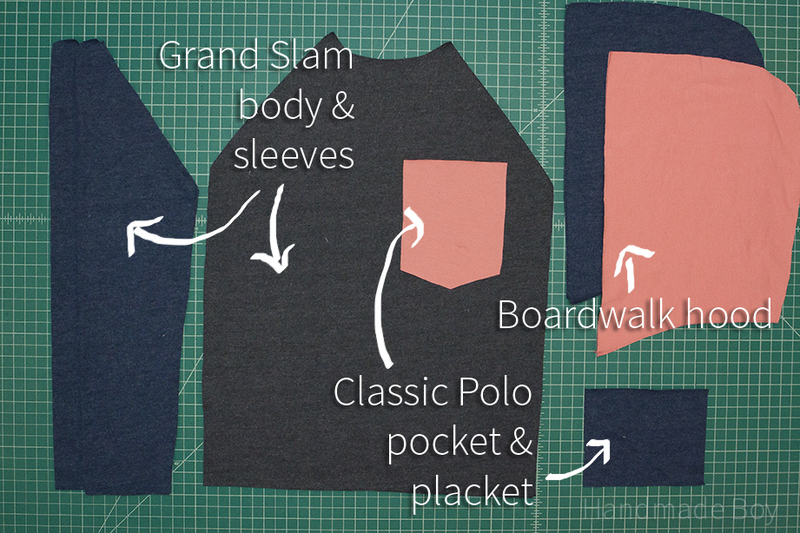 Begin with steps 1 and 2 of the classic polo to construct the button placket. Complete step 3 also, but do NOT sew the placket into place! 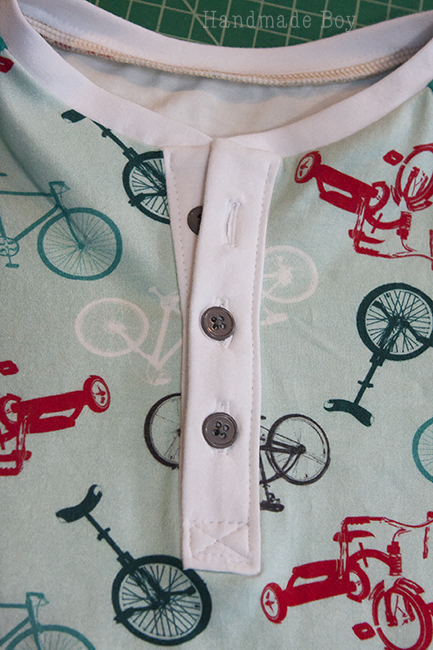 You can pin the bottom of the placket sides to keep things in place if you like. Step 2. 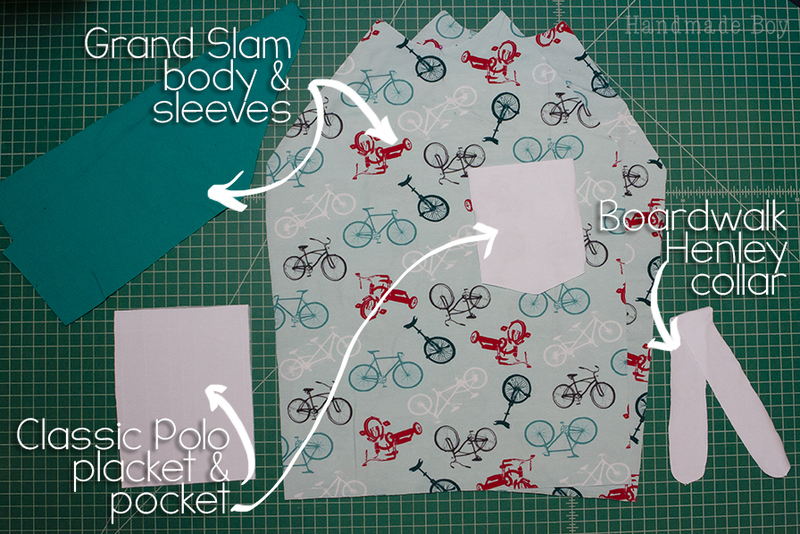 Attach the sleeves using steps 7, 8, & 9 of the Grand Slam pattern. Do NOT sew the side seams yet! Step 3. 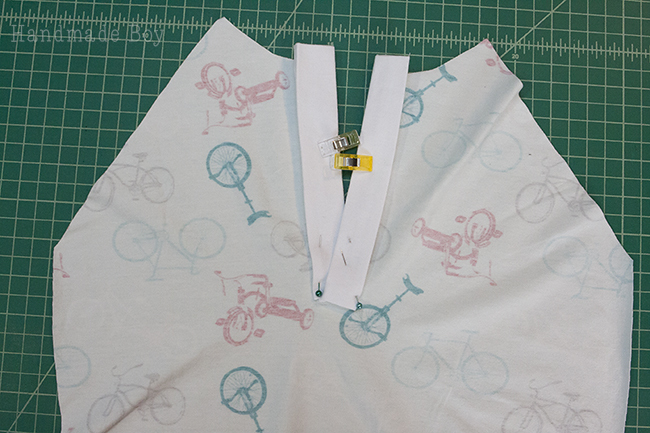 Trim the placket even with the neckline. Step 4. Go to step 10 of the Boardwalk. 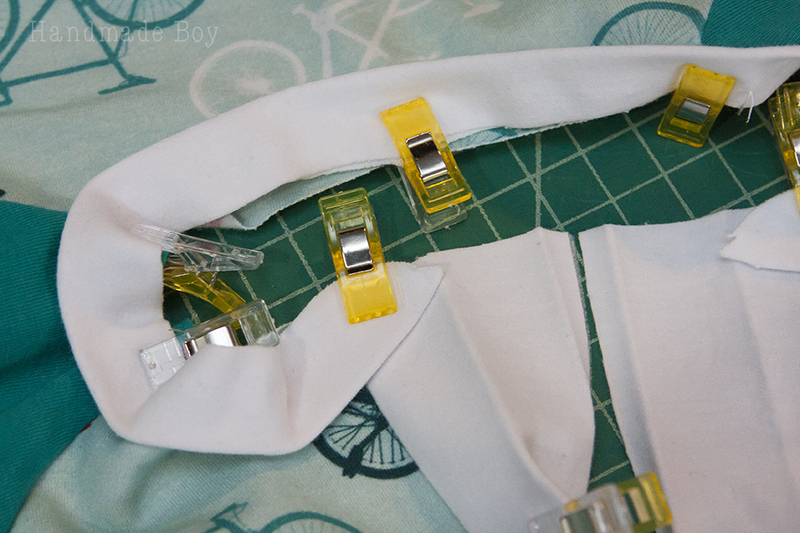 Line up the notch of the collar with the center of the back body piece. 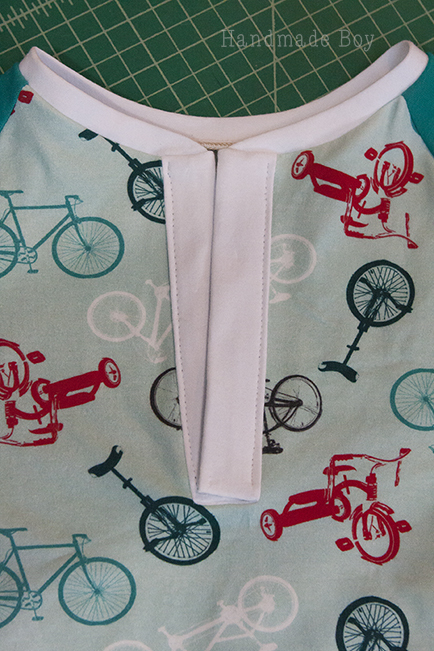 Line the end of the collar up with the crease in the placket. 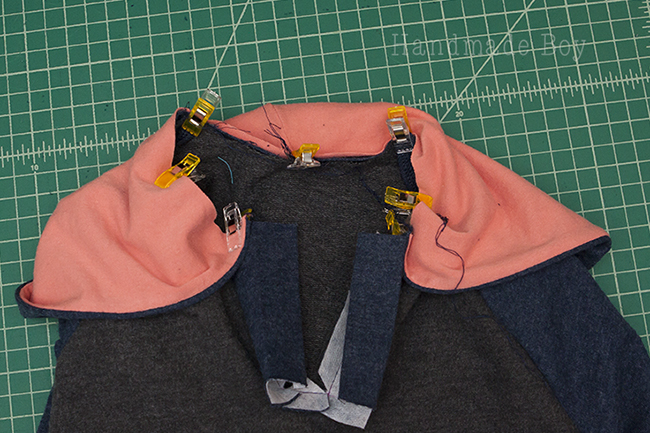 Attach the collar as instructed in step 11 of the boardwalk using a 1/4″ seam allowance. Step 5. Using the creases created in step 1 of the placket construction, complete step 12 of the boardwalk. Complete step 14 of the Boardwalk and topstitch along the placket to hold into place. I do this from the right side of the fabric. 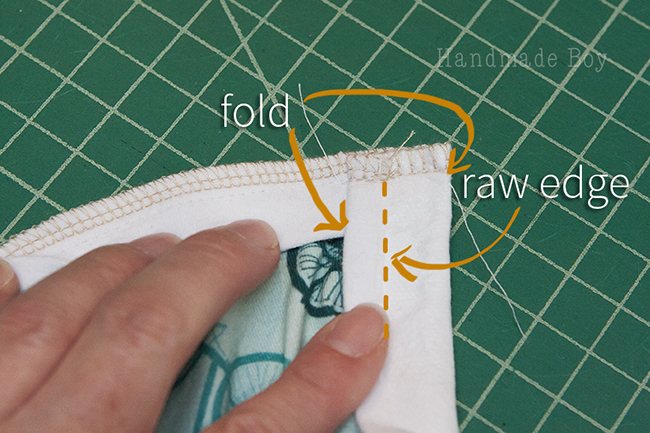 Just be sure to catch the bottom of the placket in your stitch. 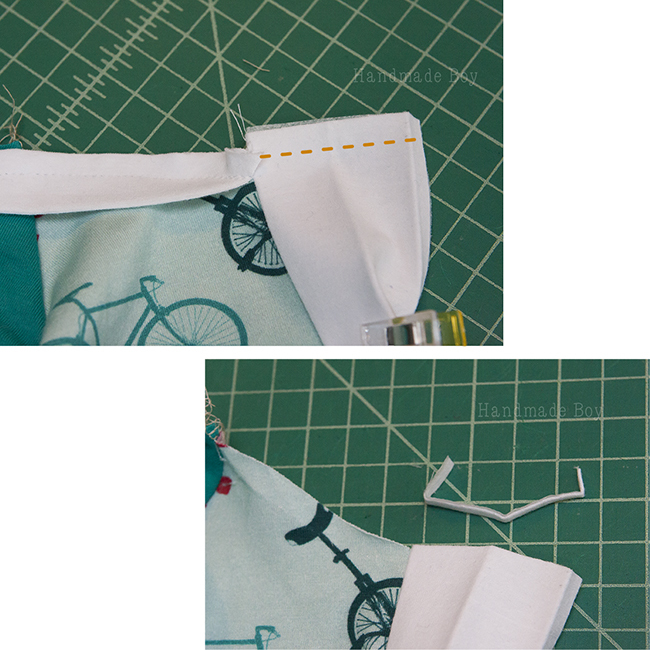 Do not sew the bottom of the placket into place yet! Just sew down the sides. Step 7. Time to sew the bottons (or you can use snaps. 🙂 ) Use step 5 of the Classic Polo for instruction. Step 8. Sew up the side seams, hem the sleeves and bottom of the shirt (steps 6, 10 and 15 of the Grand Slam if you need reference) and you are finished! Want to create a henley raglan with a hood? We can! And it’s just as simple!! I did shorten the placket on this one. Like the look? 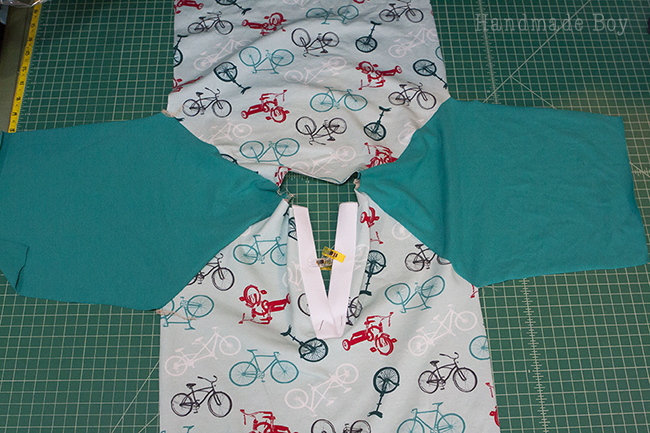 for a size 6, I cut 2.5″ off the top of the polo placket. I also made the pocket a bit smaller for the hooded raglan. I folded the top down 1″ and folded the sides in and bottom up 1/2″. Follow steps 1-3 above from the collared version. Resume with step 6 above to finish out the hooded version. Easy as that! All the topstitching along the placket is handled in the same way as we did it for the collared version. That’s it! Be sure to share your smashes with us on the Peek-a-Boo Facebook page! I know I would love to see them!